ESGRO has over fifteen years experience in the audio-visual installation and events industry. As an independent dealer and installation company, they offer a complete service. 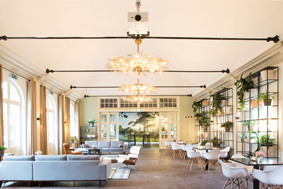 Challenge: To install high resolution projectors at ‘Buitenplaats van Amerongen’, a historical estate in the centre of the Netherlands – to be used for business events, private dinners, parties and weddings. Solution: Esgro installed the ProScene EH7700 and W501, and Optoma W316. The high resolution EH7700 boasts a brightness of 7,500 ANSI lumens so was installed in the Coach House - the largest room at the venue. Results: The step-up in performance from the Optoma projectors made an instant and obvious impact with their increased resolution and brightness. The new projectors mean the venue can offer customers more options for their events within a unique setting. 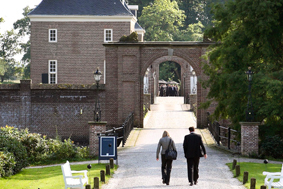 Buitenplaats van Amerongen, a historical estate in the centre of the Netherlands wanted to upgrade its event spaces, which are used for business events, private dinners, parties and weddings. In order to do this it had to upgrade its existing projectors for brighter, higher resolution models. Some of the buildings within the Buitenplaats van Amerongen estate date back to the seventeenth-century which made installations more challenging. Also, each installation needed to be completed in-between events to minimise disruption at the venue. Esgro recommended and installed the ProScene EH7700 and W501, and Optoma W316 in 2014 and 2015. Esgro advised the venue to install Optoma projectors because of their previous experience working with Optoma. Also, Optoma’s large range of projectors meant they could easily select models to meet their requirements. As visitors could stand close to the projection screens, it was important that the projectors were a high resolution. 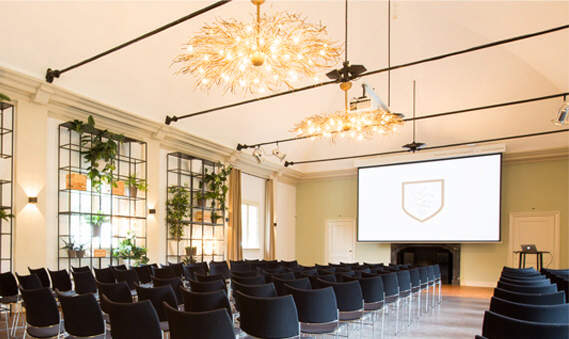 The EH7700 projector was chosen for the Coach House - the largest room at the venue, due to its outstanding brightness (7,500 lumens) and clear imagery created through the WUXGA resolution. The projector chassis needed to be white to blend in with the venue’s contemporary interior. 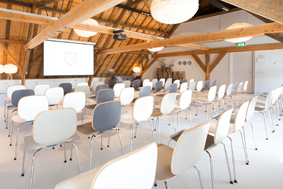 Optoma’s ProScene W501 projector was selected for the meeting room on the upper floor of the former hayloft. The seventeenth-century building had recently been restyled to provide a multi-functional space with a comfortable seating area, contemporary furniture and accessories. This meant the projector needed to blend in and also produce a high quality image for meetings and other events. The Optoma W316 was installed in the Carriage House building, built around 1900 to house the collection of coaches. It needed to be installed high up so reliability and minimising maintenance were key considerations. The new projectors were cost-effective and exceeded Buitenplaats van Amerongens’ expectations both in terms of cost and picture quality. The step-up in performance from the Optoma projectors made an instant and obvious impact with their increased resolution and brightness. The new projectors mean the venue can offer customers more options for their events within a unique setting. Optoma ProScene EH7700 and W501, and Optoma W316.